March for Jesus is an annual interdenominational event in which Christians march through towns and cities. March for Jesus began as City March in London in 1987. It emerged out of the friendship of three church groups: Pioneer, led by Gerald Coates; Ichthus led by Roger Forster; and Youth with a Mission led by Lynn Green. Together with the worship leader Graham Kendrick, they led a movement which over the next three years spread across the UK, Europe and North America, and finally across the world. Hundreds of smaller marches emerged in its wake. In 1994 the first Global March for Jesus covered every time zone and united over ten million Christians from over 170 nations. It is estimated that, by the final Global March for Jesus on 10 June 2000, over 60 million people in 180 nations had marched for Jesus. Although the founding organisation disbanded after the 2000 march, March for Jesus continues in many countries in multiple and varied initiatives. In the USA, Jesus Day is the day that many thousands of people gather to pray and march in the name of Jesus. So much of what happens in the church goes on behind closed doors. The once powerful, visible church has become virtually invisible. I have a vision for the church becoming visible again – the ‘bride on display’ if you will. It’s time for the bride of Christ to quit hiding and show herself. March for Jesus resurfaced in Canada in Calgary, AB when in 2010 Artur Pawlowski the lead pastor of Street Church Ministries International and Jim Blake National Chairman of Concerned Christians Canada Inc. teamed up with a solid core of non-denominational believers to restore the March for Jesus back to Canada, after 10 years of absence. The March in 2010 began with a gathering in Millennium Park (Calgary) with prayer and a chain cutting ceremony officiated by then Alderman Ric McIver and Mayor of Truro Nova Scotia Bill Mills. 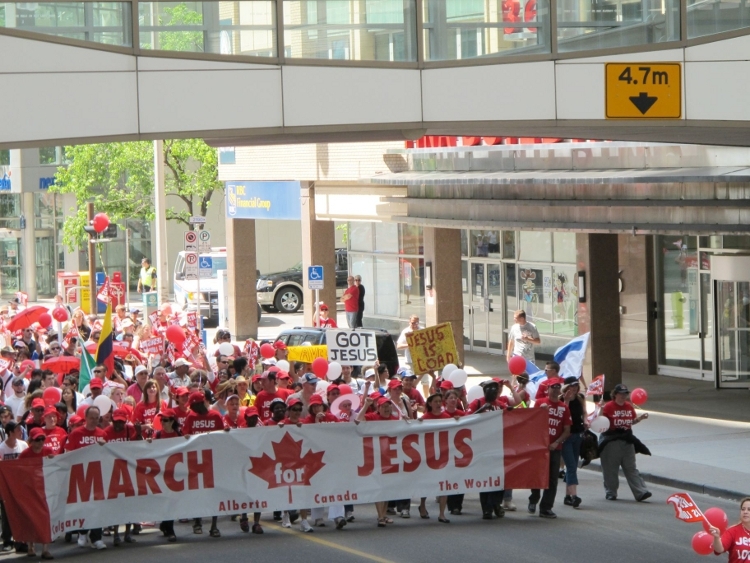 The march with some 4,000-5,000 attendees progressed through the historic core of downtown on Stephen Avenue Mall making a few stops along the way for prayer and edification including a historic stop in front of the home of the former Calgary Prophetic Bible Institute, run by evangelist, and later Alberta’s first Social Credit Premier William Aberhart, the march then continued and finished at Olympic Plaza. October 3, 2010 Artur Pawlowski Comments Off on March for Jesus reports.